Falco Resources Ltd. ("Falco" or the "Company") is pleased to report the three (3) initial drill results from its 2016 exploration and development program at its 100% owned Horne 5 project located in Rouyn-Noranda, QuÃ©bec. The two (2) initial holes were drilled in the existing Horne 5 mineralized envelope. The third hole was drilled in the Horne 5 West Extension Target. Luc Lessard, President and CEO, comments: "We are very pleased with the initial result from the Horne 5 West drilling, this first result demonstrates the potential for further resource definition to the west of the currently defined Horne 5 deposit". The first two (2) drill holes were completed within the existing Horne 5 deposit envelope. The drill holes tested specific areas of the Horne 5 deposit in order to increase the geological and metallurgical understanding of the Horne 5 deposit. Highlights from new drill holes include 43.2 metres at 2.73 g/t AuEq in drill hole H5-16-17 and 177.2 metres at 1.71 g/t AuEq in drill hole H5-16-18. Details of the new results are outlined in the attached table. Positive results from hole H5-16-17 have confirmed grade and thickness at the western edge of the deposit. Due to its location, hole H5-16-17 cannot be compared to the historical database given there is no data within a 15 metre radius of the encountered mineralization. The mineralized interval of hole H5-16-17 correlates well with the thickness of the envelope interpreted in the resource estimate -- see January 25th, 2016 press release for details. Hole H5-16-18 tested an area specifically for metallurgical purposes, yet also improved our confidence level in the historical database. Given the location of hole H5-16-18 a comparison to the historical database was completed. The reported interval was of 177 metres, however in order to compare the results to the historical database, 37 metres of mineralization were not used. This additional mineralization of comparable grade could suggest an increase in thickness on the Horne 5 mineral envelope in this specific zone. Details of hole H5-16-18 are outlined in the table below. 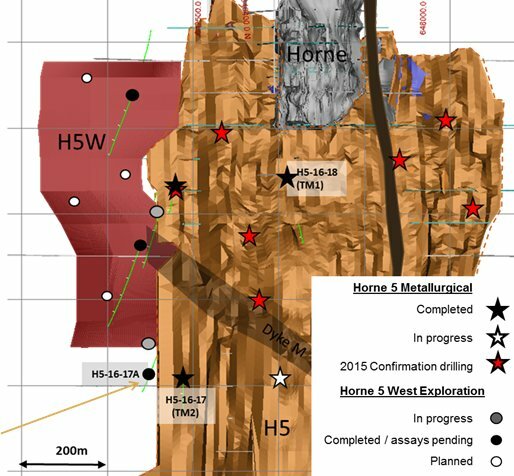 The Horne 5 Western Extenstion drilling program was initiated to test potential mineralization located west of the currently defined Horne 5 deposit. The Company initiated a 10,000 metre drilling program to test an area located between the western edge of the Horne 5 deposit and the Horne Creek fault, the tested zone being located between 600 metres and 1,300 metres below surface. The tested area was never specifically targeted previously. Positive results from hole H5-16-17A have confirmed presence of grade and thickness in the western continuity of the Horne 5 deposit. This initial result is very encouraging. Highlights include 12.4 metres at 5.14 g/t AuEq. Details of the new result are outlined in the table below. Gold equivalent calculations are based on the following assumptions: metal prices of (all $US): gold $1,250/oz, copper $2.85/lb, zinc $1.00/lb, silver $17.00/oz. The results are presented uncapped. True widths are not known at this time.